While not ever marketed as "Disneykins" the Sword In The Stone figures are considered part of the Disneykin line due to their size, detail and manufacturing lineage. The miniature HO scale Sword in the Stone Playset was marketed briefly following the initial release of the 1963 animated film THE SWORD IN THE STONE. For more information see the listing in the Disneykins Database. Pictured are rare unpainted white versions of nine of the eleven the figures -- standing in front of Madame Mim's cottage. From left to right are: Arthur (adult), Sir Ector, Sir Kay, Madame Mim, the Wolf, the Sword in the Stone, Wart (boy), Archimedes the Owl (with fish) and Merlin. Not shown are: Madame Mim (as Goon) and the Dragon. 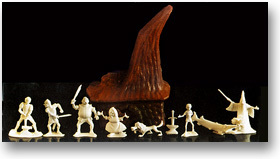 The HO scale Sword in the Stone Playset contained a complete castle, knights, horses, huts, trees, rocks, paper playmat and eleven painted character figures. The playset's detailed Disney character figures are unique to Marx, and have become some of the most collectible Disneykin figures. Above is a photo of the box cover of the playset. The Flubber Gallery recently acquired a complete boxed SWORD IN THE STONE playset. More photos and other information will be coming soon on Disneykins.com.